This tea really captures the sweet creaminess of Irish Cream. A spot of milk opens up the flavor. Perfect in the morning but great any time. 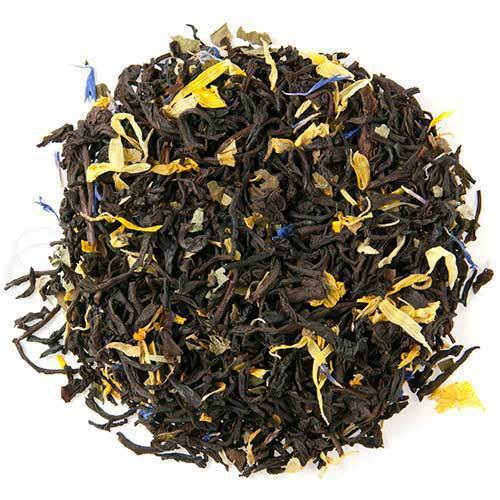 Combines black tea, blackberry leaves, calendula, sunflower, and cornflower petals. Cup Characteristics: This tea really captures the sweet creaminess of Irish Cream. A spot of milk opens up the flavour. Perfect in the morning but great any time. Luxury Ingredients: Black tea, Blackberry leaves, Calendula & Sunflower & Cornflower petals, and Natural flavors. Irish Cream Liqueur dates to the 6th century when Irish Monks traveled to the Middle East and learned the art of distilling. Initially they were interested in making perfume – but being Irish, it took only a short while before they realized the process also worked for whiskey, or “Uisce Beatha” which in Gaelic means “Water of Life”. The monks, who were also famed dairymen, found that blending their whiskey with fresh cream produced their well-known concoction. As we all know now in the 21st century, Irish Cream is a delicious drink on its own or as an addition to many great recipes. True to the spirit of the old monks we created this blend. It‟s great at breakfast. Top o‟ the morning to you! Secondly… we use flavoring oils not crystals to give the tea drinker an olfactory holiday before indulging in a liquid tea treat. Thirdly… we specify natural flavors. High quality tea tastes good and natural flavors do not mask the natural taste of the high grown Ceylon tea. (The norm for many making flavored tea is to use overpowering artificial flavors, which can be used to hide lower quality tea). Natural flavors do not leave an aftertaste giving the tea a clean and true character. It should be noted that natural flavors tend to be somewhat „soft „ and the flavors slightly muted, but for many this is a refreshing change and one of the desired attributes of our naturally flavored teas.